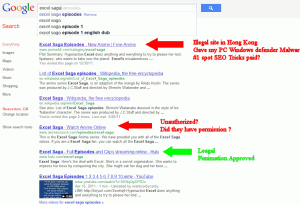 While I was putting together a post why I support the Stop On line Piracy Act, I conducted a web search on Goggle using Excel Saga, a currently anime I am interested in, looking who had streaming downloads and episodes. I got the smoking gun on Google listing pirated media sites and more than I expected. As you can see the top result is anime44[dot]com (DO NOT CLICK ON THE LINK). Next by animecrunch[dot]com and finally Hulu (I am excluding Wikipedia). When I click on anime44 link to check if they got the goods, I got what I was looking for and a copy of the Fake Home security center scam ware on my system.. Result is a rouge site Vietnam using Hong Kong to shield their ID. As for Google part, simply looks the other way because Google make money first allowing such listings bringing traffic and advertiser revenue. No wonder Google is dead set against SOPA. The have to dump illegitimate pirated sites, who are lining the Pockets of Google, Facebook, Paypal and a host of others. The losers are the intellectual property owners and victim who fall for malware scams and Otakus such as myself as Anime production studios must cover losses by pirating with or go out a business resulting in higher prices and less selections. SOPA will go after offshore rouge sites by give tools to intellectual property owners to protect themselves from fraud and theft, think Funimation. 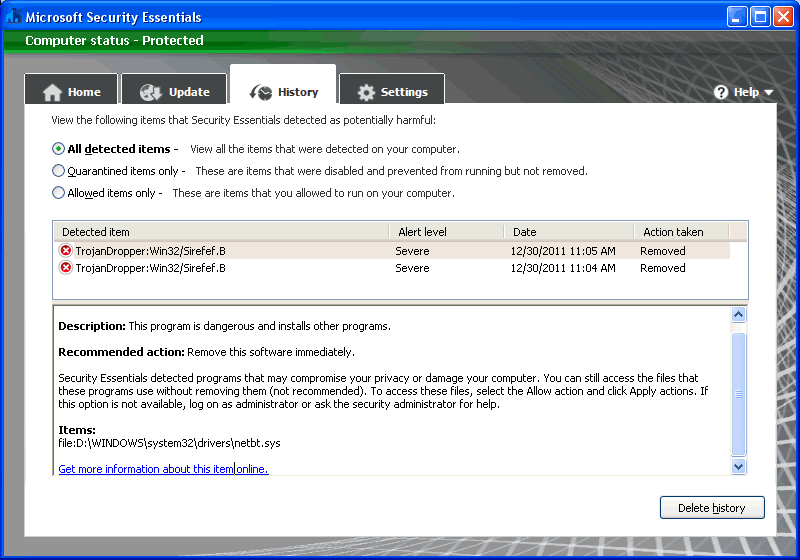 Furthermore SOAP will take away pirated media, a tool scam ware site use entrap unsuspecting web surfers. Legitimate websites will have noting to fear. Companies like Google will have to do real innovation that allows narcissistic twits to rip and spam what others produced. This entry was posted in Internet Trash, Media, Politics, Technology and tagged Funimation, Goggle, Intellectual Property Rights, Malware, Pirated Media, SOPA. Bookmark the permalink.